If you're looking for an idea on a new career field, consider becoming a professional Chef! Who doesn't like dining in luxury by candlelight while you letting your taste buds experience total culinary delight? Have you ever thought about becoming the artist who can create a dietary masterpiece? What does it take to become a professional chef? Like all good things, earning the chef title takes time and effort. Formal training and hands-on experience need time to cultivate to bring your skills to the level of a professional. A fast track to the title could be by attending a culinary training institution or becoming an apprentice where you train under experienced chefs. Some of the best professional chefs are found in large cities across the world. Culinary arts school instructors in this area of the country are quick to tell would-be chefs what characteristics play a vital role in their quests for professional status. From personal observations from chefs who have attended a cooking school and reached the level of Executive Chef or Master Chef, the first two traits that stand out are hard work and creativity. Becoming a chef will require dedication to the time and tasks of completing culinary school, working through an externship and gaining years of experience through frontline work in restaurants. As you build your cooking and baking skills, you'll incorporate the physical tasks of chopping, slicing, mixing and others into the creative tasks of developing recipes and plating your dishes with unique presentations. The end result is a multisensory experience of sight, smell and taste that truly brings pleasure to those who eat what you've prepared. What else is required? The ability to work as part of a team. Yes, even though Rachael and Emeril appear to be going it alone on their shows, they have an entire staff behind the scenes that assists them. A professional chef must be able to delegate responsibilities, supervise the work of others, coordinate every step of the menu and culminate the efforts of everyone involved into wonderful dishes that are served hot, fresh and on time. A sincere love for food is also needed to be a great chef. Do you wonder about how different seasonings and textures work together? Are you always experimenting to find new combinations of spices, herbs and sauces that bring out the flavor of your dishes? This curiosity and love of food will certainly work in your favor as you strive toward your goal. Do you have these characteristics? Does running your own restaurant interest you? Do you have a passion for cooking? 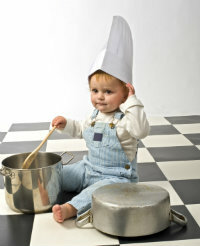 Perhaps you have a future as a professional culinary chef.